After AISHA by AMANAT ALI, Taking the stage next are the Shah Jo Raag Fakirs, accompanied by their unique five-stringed traditional instrument dhamboora. 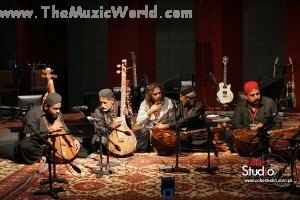 Led by Fakir Juman Shah the Fakirs recreate the mystic aura of the Bhit Shah shrine with a profoundly emotive rendition of 'Moomal Rano' from the Shah Jo Risalo. To download MOOMAL RANO by FAKIR JUMAN SHAH (COKE STUDIO 3), click on the links given below. Thanks for the wonderful translation!